At Tip Tops we like to celebrate our holidays and one of our favorites is just around the corner. 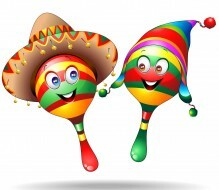 Cinco de Mayo is mostly celebrated in Puebla, Mexico and in some parts of the United States. If you enjoy recognizing this holiday make sure to order your Cinco de Mayo themed t-shirt today! Whether you celebrate with your family at a backyard barbecue or go bar hopping with friends, your group should enjoy the day in style. Order your Cinco de Mayo t-shirts now for a guaranteed good time. You can make an original design by incorporating a sombrero, a mustache, maracas, a Mexican flag, an American flag, or anything that reminds you of Cinco de Mayo into your t-shirt design. At Tip Tops we are prepared to help you celebrate any holiday. Submit your design on our website or call and speak to one of our experts today! We’re glad to be your go-to place for screen-printing in Florida and we look forward to meeting all of your custom t-shirt needs.